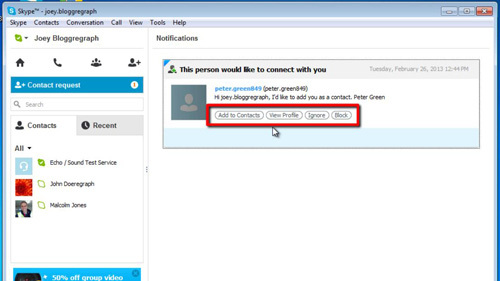 In this tutorial you are going to learn how to see Skype friend requests. Recently, Skype has changed the wording from “friend request” to “contact request”. These are the same thing. Open Skype and sign in to your account. In the main Skype window, on the left hand side of the window, in between your Skype name and your contact list, there will be a grey title bar saying “Contact requests” if anyone has sent you a request. There is an orange icon on the right side of this title bar. This number within this icon indicates how many unanswered friend requests you currently have. Click on this “Contact Request” title bar to see the details of your requests. Each request will be in a separate pane. These appear in the right hand section of the Skype window. Within each pane you can select to “Add to contacts”, “Block” or “Ignore” the contact request. It is possible to view the contacts profile as well before you decide to add them. 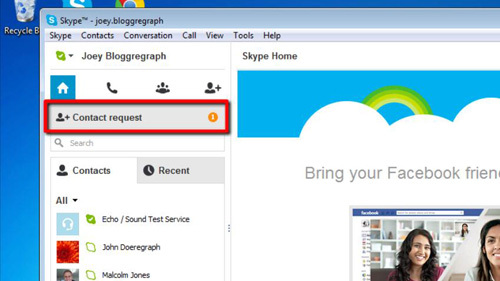 This is how to see Skype friend requests.